On Friday, August 20, around 2:45 pm, I was driving to the Cub Foods supermarket on West Broadway Avenue North. 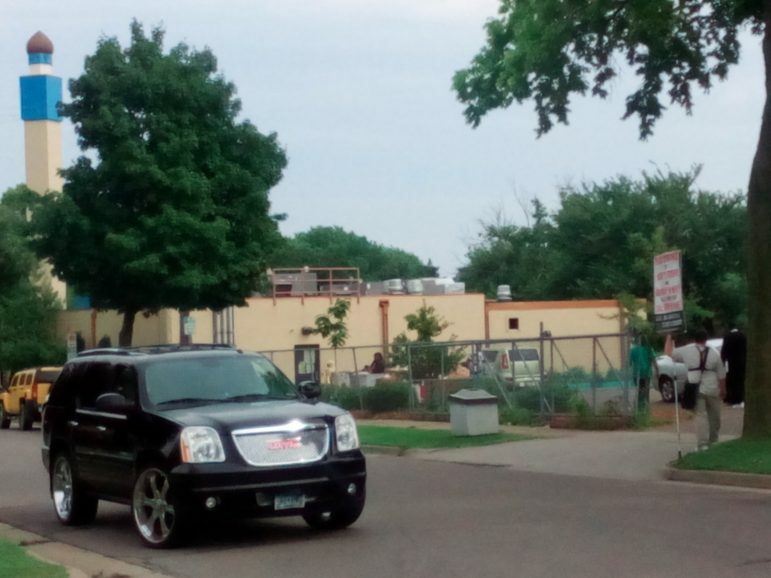 Taking the back way to the store, I drove north on Lyndale Avenue to turn west onto 18th Avenue to enter the store’s parking lot on its south side. 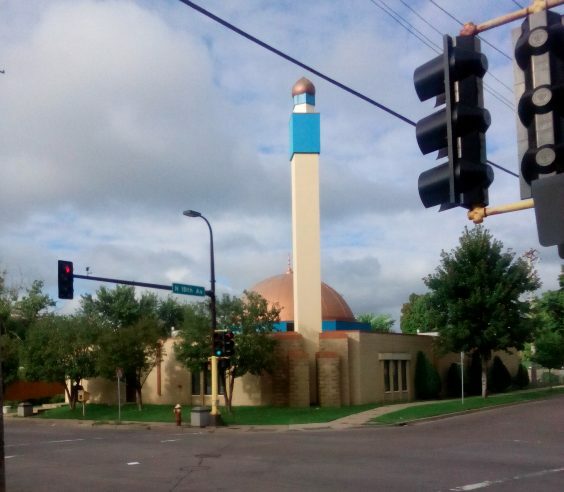 Masjid An-Nur, a copper-domed mosque, is on the corner of 18th Avenue and Lyndale, across the street from Cub Foods. As the man stood with his sign on the sidewalk, Masjid An-Nur’s parking lot was full of people in traditional Islamic dress and Western street clothing, as the mosque was doing a food giveaway on the lot. Additionally, Friday is Islam’s day of jumah, the weekly worship service, and so many people may have been leaving after attending the jumah that started at 1:30 pm. Masjid An-Nur (“Mosque of the Light” in Arabic) was founded in North Minneapolis in 1990 and has been at its current location since 1995. A new, larger building was constructed at the site in 2007 that has a copper dome and copper-topped minaret tower, making the building more distinctive and recognizable as a mosque. I’ve lived in North Minneapolis since 1999 and am very familiar with the mosque. That’s why I was so surprised to see any anti-Islamic activity at Masjid An-Nur — I had never seen it before. Wanting to know if this was part of a new surge in bigotry since the bombing of Dar Al-Farooq Islamic Center in Bloomington on August 5 and the deadly Charlottesville, Virginia White supremacist rally and counter-rally on August 12, I asked to speak with an imam (prayer leader and scholar) of the mosque about the picketer. Imam Makram El-Amin of Masjid An-Nur is a member of a family of distinction in North Minneapolis. For years, the family operated the now-closed El-Amin’s Fish House on Broadway Avenue North, and the iman’s brother Khalid is a former prep basketball star who made it to the NBA and has had a long career playing with overseas teams. Additionally, his mother Arlene El-Amin is the director of community outreach programs at the mosque. When asked about the picketer, the imam confirmed what a mosque parishioner told me: This man or sometimes another older man using the same sign has picketed in front of the mosque a few times a year for years. El-Amin added that the picketer also “makes disparaging remarks about Islam, about the religion, about the Qu’ran, about Muhammad the prophet of Islam, and Muslims in general and what our true quote-unquote motives are. 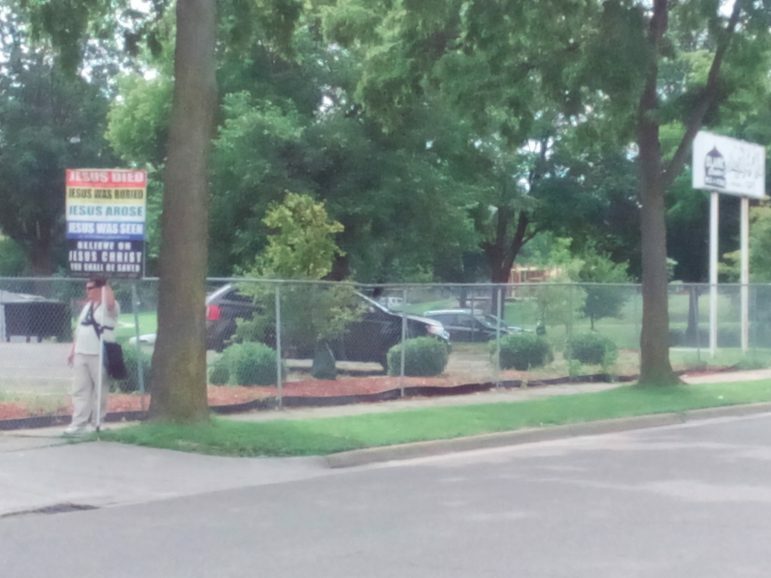 As for any other visible anti-Islamic activity directed at Masjid An-Nur other than the single White picketers, El-Amin says there has been none in recent memory. “We’ve lived here; I’ve grown up here in North Minneapolis. The mosque has evolved over time, so we enjoy a very good reputation and respect of the community. We have folks who are doing meaningful work in the community,” including U.S. Rep. Keith Ellison, who is a member of the mosque. Besides the parking lot food giveaways, Masjid An-Nur is involved with other community service work such as affordable housing and helping formerly incarcerated people re-enter society successfully. The mosque also opens its door for group dialogs, including a recent group of professors who were attending a conference at the University of Minnesota. The educators came to the mosque to “talk to us about Islam and the landscape of Muslims in the United States,” El-Amin said. “These are the kind of exchanges that generally happen” at Masjid An-Nur, El-Amin emphasized. Stephani Booker welcomes reader responses to rbooker@hotmail.com.